We sat in the car with the windows open, holding our breaths and straining our ears to hear it again. It was near pitch dark and forest was deadly silent except for the guttural roars of a tigers mating call from metres away from us. Visiting India is a sensory bombardment of smells, colours and unfiltered life. For some it is understandably overwhelming, but for others it is just plain grin-inducing roller coaster of wonders. I fall in the latter category and one of the main reasons for this is the sheer plethora of wildlife here. You can walk down any street in India and will see more wildlife in an hour than any given week in Europe. Tigers and elephants are the most famous inhabitants, but there are also lions, leopards (snow, regular and panthers), bears and rhinos on top of the omnipresent monkeys and innumerable bird species! It is this abundance of fauna and flora that makes India a top destination for the wildlife enthusiast. The Western Ghats is a mountain range running along the western side of India and is one of the ‘hottest hotspots’ for biodiversity in the world. As you can imagine there is significant (but not enough) effort to protect this area, and it is dotted with national parks, elephant corridors and tiger reserves. It was at one of these tiger reserves that I had my most memorable wildlife experiences in India to date. It wasn’t due to what we saw that made the trip amazing, although we did see a lot, but it was more to do with how we saw the animals and how the forest engulfed us in the situation. I had never felt so close to nature. Like everything in India, the trip my wife and I took to Bandipur Tiger Reserve in Karnataka was unpredictable. It was unplanned and completely unexpected. We were in the area and decided to stay for the weekend, and wow, are we so glad we did! From the moment we entered the park it felt like we were being swallowed up by the forest, welcomed by birds singing, trees swaying in the breeze and a deer drinking by a nearby pond. The forestry department strictly controls all tiger reserves and national parks in India. All safaris in the park are in government vehicles, driven by government guides. No matter where you stay in or around a park, be it a government lodge or private resort, it is all government controlled access to the core areas of the park. Trespassing comes with a very heavy punishment. We had time for only one safari on our tight schedule so we were excited to get in the jeep and head into the unknown. The safari started off quietly with little animal movement or alarm calls indicating the presence of a predator. But with numerous Spotted and Sambar deer around, the big cats’ food of choice, we remained hopeful. The forest was quiet, unnerving yet peaceful, all of which added to our anticipation. We went on, with increasing tension and excitement, spotting many birds, monitor lizards and enjoying the feel of the forest. 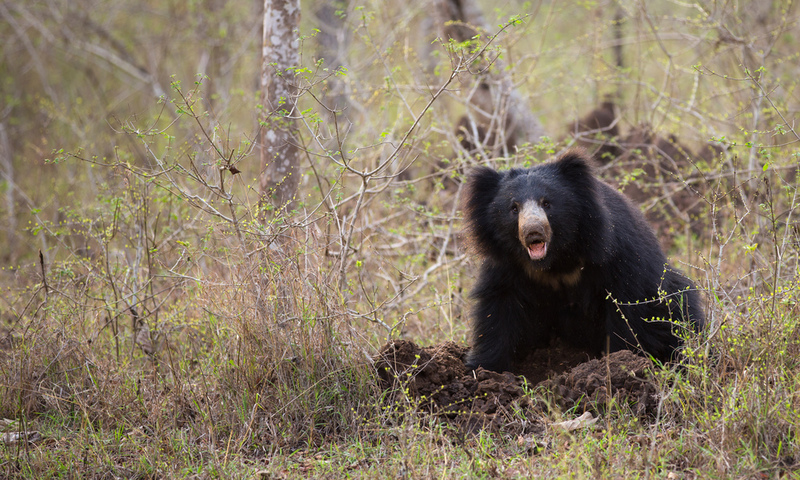 Close to the end of the tour we crested a small rise to come across a Sloth bear rummaging in a termite-mound about 10 metres away from the road. Focused on its dinner it hardly paid any attention to us, lifting its head only to recognize our presence briefly before digging around for more termites! We sat quietly for what seemed like an age, revelling in the bear being so close and at ease, they are usually very wary of humans. When all of a sudden it patience with its uninvited dinner guests vanished and it charged at us stopping scant meters from the car and rearing on its hind legs. There were four cameras following the bear, but not one picture was taken, all of us were leaning away from the bear in shock and fear! We sat still holding our breath until it slunk off into the bushes, obviously satisfied that it was the victor. After witnessing the speed of the bear I have felt that ‘sloth’ probably was not the most appropriate name for it! High on adrenaline, we moved on. The sun was setting behind the clouds and the light was diminishing, it was time to head back. We reached a cross road, and paused to pick up a carelessly discarded plastic bottle in the middle of the road. While the forest-department driver got out to pick up the litter, I joked with the others in the jeep that “this is when I wouldn’t like to see a tiger”, prompting sniggers. The driver returned with a nonchalant smile on his face and mentioned in an off-hand way “there is a tiger over there”! Our first reaction was appreciating his sense of humour, should he not be kidding. Emerging from a bush a tiger strode into the clearing just opposite us. Goose-bumps rose on my arms as we watched the tiger saunter across the field in the eerie silence of the setting sun. The scene is etched in my mind and still haunts me. It wondered through patch of grassland, weaving between the trees until gradually disappearing into the thicket at the back. We were left breathless and in awe. First a bear and then a tiger! It was getting dark by the time we left the park and were heading back to the resort. We thought that we had reached the end of the day’s adventure, but this was not the case: the forest had one last treat in store for us! Whilst winding our way back through the narrow lanes a small group of spotted dear mulled around by the side of the road. We stopped and waited for them to cross but they did not move and stood attentive and quite. We waited in silence, pondering the deer’s strange behaviour, when a guttural roar pierced the silence. It was the mating call of a tiger, and it was close, very close! Seeing a tiger is exciting and awesome, a privilege I hope everyone can enjoy in life, but to hear a tiger, so close, in the dark without seeing it was absolutely out of the world. Fear invoked adrenaline coursed through my veins. We sat, the windows open, listening with bated breath. There it was again, but closer still! Again and again it roared, every time getting loader as it came nearer to our car. The tension was palpable as we made guesses to how close it was… 15 metres? 10 metres? 5 metres? We all sat there for about a quarter of an hour listening to the tiger’s ‘song’, until it eventually faded into the night, leaving the forest hushed once again. The next morning, we sat around reliving the excitement of the previous day. It was the first time I had seen a bear, and we lucky to have seen it for so long and so close. Jokingly, I mentioned how if we had only seen a leopard up a tree, I would have felt the trip was complete. Moments later, the phone rang, a leopard had been spotted near the entrance of the park. We jumped into the car and rushed to the spot to find, much to our astonishment and amusement a leopard sitting up a tree. The trip was complete and sadly over. We left the park but a piece of Bandipur will always stay with me. A piece of Bandipur that calls me in the night like the tiger, a piece of Bandipur that beckons! For more wildlife photographs, check out my wildlife gallery!